Bizarrely-named churches tend to stand out but someone must’ve got into the sacramental wine before tagging titles on these 10 hilarious houses of worship. Go ahead and snicker, Millennials, but the International Church of the Foursquare Gospel (aka The Foursquare Church) was founded in 1923 by Aimee Semple McPherson. Using “Blazing Saddles Logic”, the church can sue the Foursquare City Guide app which dates back to only 2008. Oh, and hopefully they’ll use a font other than Comic Sans when filing their legal briefs. Seriously guys, Comic Sans?? 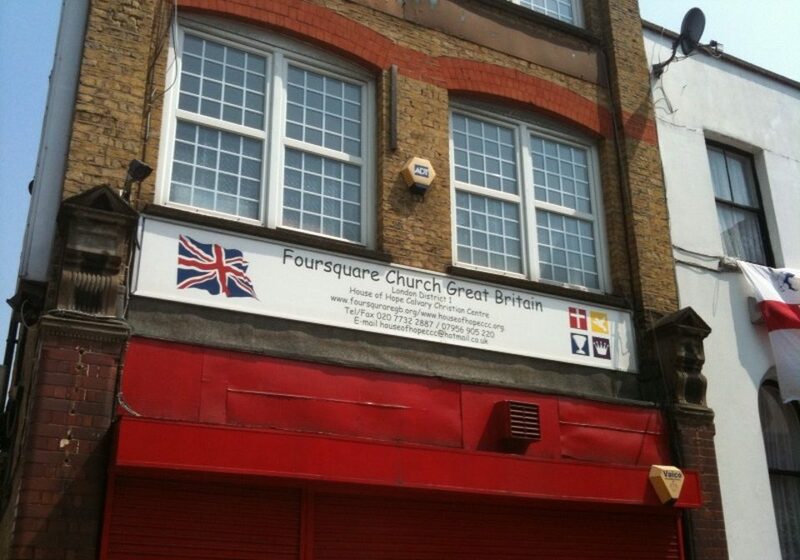 Flickr members Manne and Nick Richards snapped the Peckham, London, UK location of the evangelical Pentecostal Christian denomination in 2010 and 2015, respectively. Have you seen this God? Because he is freakin’ AWESOME! He also looks alarmingly – five-alarmingly, even – like “Wilson” from the movie Cast Away. Now we know what happened to Tom Hanks’ voiceless volleyball pal after drifting away from that flimsy raft: he washed up in Buffalo, NY and became revered by the dumbfounded natives for his supernatural snow-melting power. 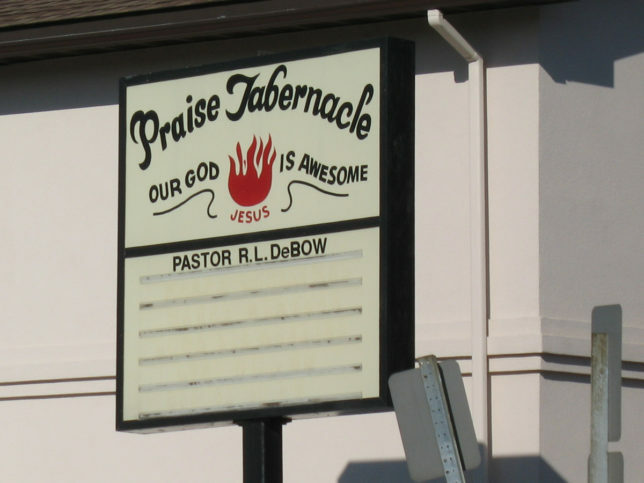 Flickr member Jamie (jbcurio) snapped the Praise Tabernacle church’s admittedly awesome signboard in March of 2008. 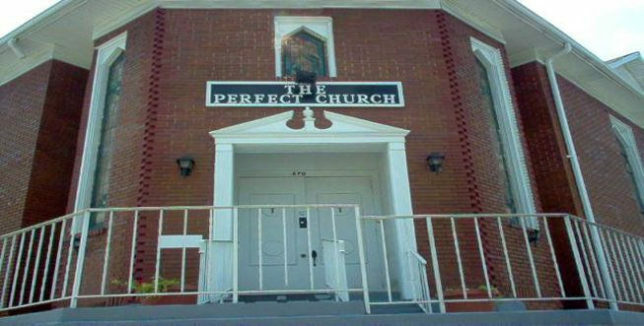 A Perfect Church for an imperfect world… and a thumb in the eye to all those other churches that obviously must be flawed in one way or another. Flickr member genebrooks snapped the red brick “religious center” located on McDaniel St SW in Atlanta, GA on March 7 of 2016. Give genebrooks credit, he’s got a knack for spotting weird churches – or in this case their van, parked somewhere in South Korea. 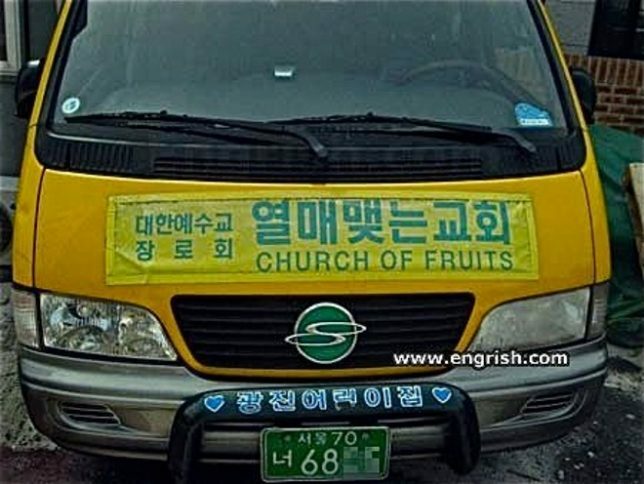 We can’t imagine what a typical service at the “Church of Fruits” must be like but we assume their communion wafers offer parishioners sweet salvation with added Vitamin JC. We’ve got a reality show president so why not a church where the only thing scripted is… the scripture. Welcome to the 1st Keep It Real Fellowship Church, located in Little Rock, AR. We imagine Sunday sermons exhort penitents to keep the faith first, and ask questions like “If God is all-powerful, can He make a rock so heavy He Himself can’t lift it?” later. Flickr member LRD615 snapped the very real, as in “you can’t make this stuff up” real, church in March of 2007.